Melt chocolate over a double boiler with water in the bottom and a pyrex dish on top. Once melted, add protein powder, cup of oats, espresso and splenda (I add cinnamon as well). Mix well and allow to cool. Once cool, use a small scoop/spoon to shape the truffles and place on baking paper and allow to cool for 10min. Take a cup of Vanilla or other protein powder flavor and roll the truffles in them. 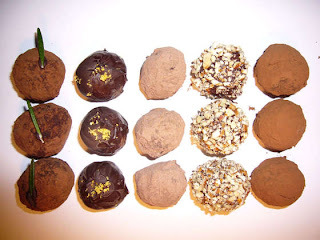 Variations: Use cocoa powder instead of chocolate, add nut butter to batter, hemp, flax, chia, greens powder, rice crisps,crushed peanuts/coconut, use orange extract (any extract flavor drop-mint, almond,coconut etc). Roll the truffles in shredded coconut or hazelnuts. Use different protein powder for coating (ex chocolate raspberry). I love using peanut butter flavored protein or cookies and cream, adding oats, sweetener, almond butter, adding coconut or finely crushed nuts/or poppy seeds or adding PSYLLIUM husks to it! Great recipe! Thanks. Do you think you will ever list the nutritional information for your creations? P.S Thanks for answering my past questions. You might also be interested in Agave Nectar as it tastes amazing, is 100% pure and natural, and is safe for diabetics. You guys HAVE got to try this! AH so good!